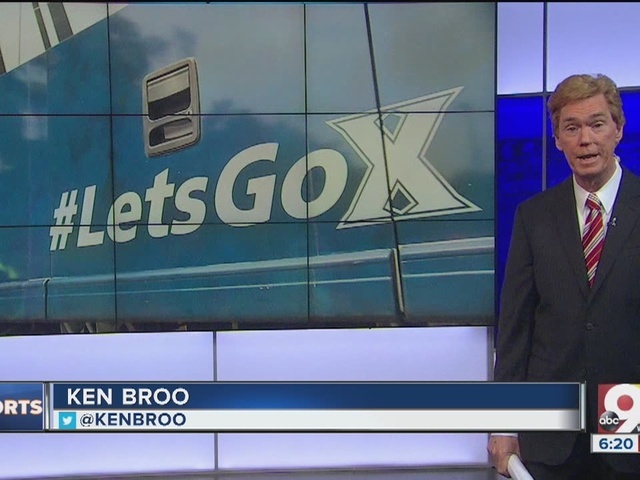 CINCINNATI — Scott Googins was expecting all along to be on his way to the NCAA Tournament with his Xavier baseball team Wednesday. Even when the Muskies opened the year 0-7. Even when they were 3-12. “I really did,” he said. “I know we started badly. But when you look at our schedule — we started out with Arizona State, Mercer won their conference, then we played Vanderbilt. That’s a tough part of the schedule. It hasn’t stopped clicking yet. The Muskies won 16 of their last 18 games and swept through the Big East Tournament to earn a trip Nashville for regionals hosted by Vanderbilt. So the XU players boarded the bus Wednesday afternoon for their second trip to NCAAs in three years. Xavier faces Vandy Friday at 8 p.m.
“When you have leadership like (that), we knew we had a chance if we could just stay positive,” Googins said. “It wasn’t easy. When you have expectations early in the year and you’re not getting the results you want — ‘packing it in’ isn’t the right words. But last year when things happened, it’s like: Here we go again. Rizzie says it was as much disgust as grit that turned it around. The Muskies won the last two games of that series in two very different games — 11-8 and 1-0. That was the start of the 16-of-18 streak. You have to have talent to get to the NCAAs, and the Muskies have that. Catcher Rizzie was Big East Tournament MVP, going 8-for-14, including 5-for-5 in the final, with six RBI in the three games. He leads XU in hitting with a .312 average with nine home runs and 34 RBI. Shortstop Jernigan, the Big East player of the year, is hitting .262 with 13 homers and 40 RBI. Gellenbeck, an outfielder, is hitting .287 with 13 homers and a team-leading 48 RBI. Sophomore right-hander Zac Lowther is Xavier’s No. 1 starter. He went 6-5 with a 3.22 ERA. Closer Garrett Schilling, a sophomore right-hander, led the team with a 1.98 ERA and 13 saves. Googins feels better going into the NCAAs this year than in ’14. The Muskies finished fourth in the Big East that year but got in with hot tournament. This year, Xavier has been hot for a five weeks. “The fact that we won the regular season and won tournament is big,” Googins said. “But you look at winning 16 of the last 18 games, it’s not like ‘Ah, you got hot.’ That’s being hot for a while. The Muskies will be decided underdogs against Vandy. The Commodores are 43-16 and ranked 10th nationally. And they have that early season sweep over the Muskies. But the Muskies know what they’re facing. John Fay is a freelance sports columnist. This column represents his opinion.